Philadelphia’s beverage excise tax is 1.5 cents per ounce, which is 24 times the Pennsylvania excise tax rate on beer. The high tax rate on nonalcoholic beverages makes them more expensive than beer in some cases. Prior research on soda taxes suggests they are likely to drive consumers to more alcoholic beverage consumption. Philadelphia’s beverage tax applies to diet beverages, despite those beverages having no impact on caloric intake. Beverage tax collections were originally promoted as a vehicle to raise funds for prekindergarten education, but in practice Philadelphia awards just 49 percent of the soda tax revenues to local pre-K programs. Soda tax revenues are likely below expectations due to consumer mobility. Some soda consumers may drive out of town to buy groceries, rather than pay the higher taxes. Poor revenue performance of Philadelphia’s beverage tax threatens the sustainability of the programs it funds. On June 16, 2016, the Philadelphia City Council adopted legislation implementing a city-wide excise tax on nonalcoholic sugar-sweetened and diet beverages. Levied on distributors, the 1.5 cent-per-ounce beverage tax went into effect on January 1, 2017. The tax, which is 24 times the state excise tax rate on beer, has received mixed reviews among constituents. Some Philadelphians support the tax for the programs it funds. Meanwhile, local business owners and workers have filed lawsuits against the tax. From an operational standpoint, the tax rollout continues to create problems for the city as collections have come in less than projected. In July, city officials lowered beverage tax revenue projections by 14 percent, leaving the pre-kindergarten programs that the tax promised to fund in jeopardy. Furthermore, soda taxes are regressive, hurting low-income earners the most. Philadelphia’s experience serves as a cautionary tale for other areas weighing similar beverage taxes. The ancillary benefit to this will be healthy choices, but it’s not the purpose. The purpose of imposing this 3-cents-an-ounce sugar-sweetened beverage tax is to allow people to get their kids educated and move them out of poverty into taxpaying citizens. Consistent with this revenue-centric approach, diet beverages were included in the tax to try to maximize its revenue potential, despite not contributing to caloric intake. However, for political reasons, baby formula, medicine, and any beverage containing more than 50 percent fruits, vegetables, or milk were excluded from the tax. The form and function of the tax also shifted from its original proposal as it moved through the legislative process. Mayor Kenney initially proposed a 3 cent-per-ounce soda tax, though the proposal was eventually cut in half to 1.5 cents per ounce. Additionally, the tax was originally promoted as a vehicle to raise funds for prekindergarten education, but in practice it awards just 49 percent of the soda tax revenues to local pre-K programs. Another 20 percent of the soda tax revenues fund government employee benefits or city programs, while the rest of the money will go towards parks, libraries, and community schools. The city estimated beverage tax revenues of nearly $410 million over the next five years, or roughly $92 million annually. Philadelphia set a fiscal year 2017 collection goal of half that amount, $46 million, since collections began in January and the 2017 fiscal year ended June 30. Initial revenue expectations were low for the first few months of the year. January’s revenue projection of $2.3 million was a conservative lower-bound estimate, and actual revenues of $5.9 million more than doubled that number. In March, City Health Commissioner Thomas Farley wrote an article in The Philadelphia Inquirer supporting the tax, saying “the city is meeting its revenue projections.” But by setting low revenue projections for the first few months, Philadelphia’s projection strategy placed greater pressure on revenue collections for May and June to yield the $46 million projected for fiscal year 2017. A June news release by the Office of the Controller noted that none of the monthly collections have met the $7.7 million per month target needed to meet the original 2017 estimate. “The city needs to collect $10 million in each of the next two months to meet its goal,” said Controller Alan Butkovitz, “a figure that appears to be significantly out of reach.” Raising $20 million in beverage tax revenues in May and June would have required an increase in average monthly collection from January through April by about 50 percent. Thus, in June, local officials opted to lower the 2017 beverage tax revenue estimate from $46 million to $39.7 million. As Figure 1 shows, collections did not even meet that amount, reaching a total of $39,466,920 throughout the entirety of fiscal year 2017, 15 percent below original expectations. Table 2 shows underperformance of collections below initial monthly projections month-over-month. 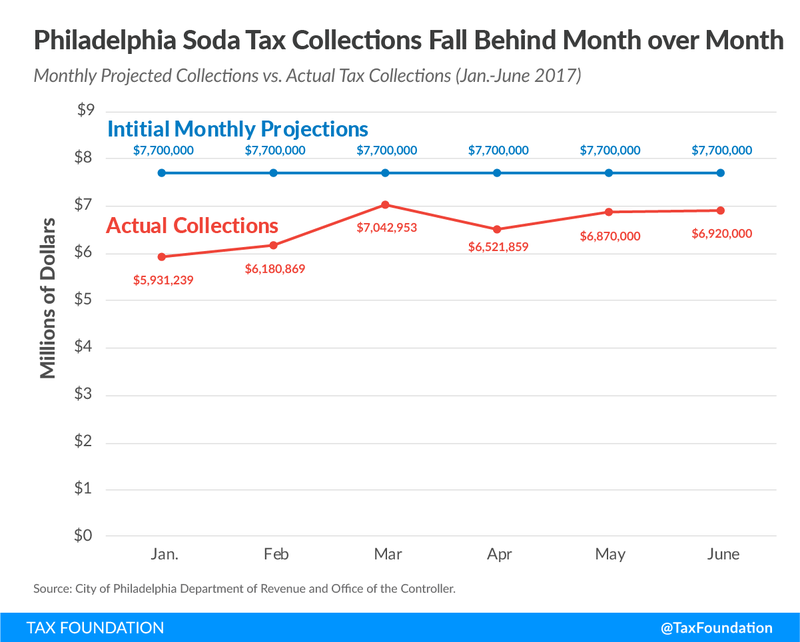 Soda sales in Philadelphia have also declined since the tax went into effect at the beginning of 2017, threatening the long-run sustainability of the tax. According to some local distributors and retailers, sales have declined by nearly 50 percent. This is likely primarily due to higher prices, which discourage purchasing beverages in the city. Some Philadelphia taxpayers took to Twitter as the tax took effect, noting their plans to shop for groceries outside the city. This kind of tax avoidance is only feasible for consumers with means of transportation, making the tax even more regressive. Purchases of beer are also now less expensive than nonalcoholic beverages subject to the tax in the city. Empirical evidence from a 2012 journal article suggests that soda taxes can push consumers to alcohol, meaning it is likely the case that consumers are switching to alcoholic beverages as a result of the tax. The paper, aptly titled From Coke to Coors, further shows that switching from soda to beer increases total caloric intake, even as soda taxes are generally aimed at caloric reduction. Soda tax revenues may also be lagging due to economic shifting behavior in response to the tax. Between the passage and implementation of the tax, retailers bought surplus quantities of soda in anticipation of the tax. Similarly, price-conscious consumers likely stockpiled beverages before the tax went into effect. Both behaviors may contribute to lower overall sales and thus, lower tax revenues than originally estimated. Concerning public program funding stability, the Philadelphia Beverage Tax website still maintains, “[O]ur revenue projections do account for a significant drop in consumption of these products within Philadelphia. But even with the drop in consumption, our revenue projections still cover the programs.” Nevertheless, the decline in consumption is worse than predicted. Ultimately, the lag in soda tax revenues jeopardizes funding for city programs, especially as soda consumption is falling nationwide as well. The soda tax has been a subject of contention in Philadelphia. Just as the city overestimated soda tax revenues, the city underestimated how much the beverage market would be impacted. Since implementation, stories have emerged of harm to local manufacturing and convenience store workers and reductions in consumer choices. For example, local branches of Coca-Cola report a workforce downsizing of 40 positions and PepsiCo reports laying off 80-100 workers as a result of decreased soda sales from the tax. PepsiCo further announced that it would be pulling all 12-pack and 2-liter products of its brands from Philadelphia grocery and convenience stores and other vendors. Disgruntled businesses and displaced workers have also filed lawsuits challenging the soda tax in court. The plaintiffs argue that the tax violates the Sterling Act by double taxing beverages since the soda tax is levied on distributors and beverages are taxed again under the Commonwealth’s sales tax when sold to consumers. Additionally, the plaintiffs argue the soda tax violates the Commonwealth Constitution’s uniformity clause since similar beverages may be taxed differently. The Common Pleas Court found that the tax did not result in double taxation and ruled in favor of the beverage tax law in December 2016. The plaintiffs appealed, and in June, the Commonwealth Court upheld the decision of the lower court and denied the objectors’ petition for an injunction to stop the tax. In July, the plaintiffs filed an appeal with the state Supreme Court. Conversely, other Philadelphians continue to advocate for the pre-K programs supported by the beverage tax revenues. An August 2016 Pew poll found that 54 percent of Philadelphians supported the soda tax, with younger residents supporting the policy in higher percentages but residents aged 50-64 opposing the policy in higher percentages. Though the tax had been enacted at the time of that poll, it had not yet taken effect. A number of cities like Seattle and San Francisco have enacted soda taxes, and states occasionally propose them. Generally, these policies are aimed specifically at combating obesity and the consumption of sugar-sweetened beverages. The stated goal of the Philadelphia soda tax as a revenue-raising measure differs from other areas, and it makes the city’s underperforming tax collections all the more noteworthy. Despite constituent support for the programs funded by the tax, the actual revenue for programs remains unstable due to poor collection performance, with potential that those revenues will continue to fall. The legal battles and consumer angst the tax has attracted make the tax unattractive as well. Other localities wishing to avoid these travails should seek funding for programs with broader-based, more predictable tax instruments. Mark Dent, “Philly admits it will earn less money from the soda tax than it planned,” Billy Penn, June 13, 2017, accessed July 07, 2017, https://billypenn.com/2017/06/13/philly-admits-it-will-earn-less-money-from-the-soda-tax-than-it-planned/. John Buhl, “The Case Against Soda Taxes,” Tax Foundation, March 15, 2017, accessed July 07, 2017, https://taxfoundation.org/case-against-soda-taxes/. PBS NewsHour, “Philadelphia mayor looks to fund pre-K with controversial soda tax — by the ounce,” May 24, 2016, http://www.pbs.org/newshour/bb/philadelphia-mayor-looks-to-fund-pre-k-with-controversial-soda-tax-by-the-ounce/. Luc Cohen, “Philadelphia passes soda tax after mayor rewrites playbook,” Reuters, June 16, 2016, accessed July 10, 2017, http://www.reuters.com/article/us-beverages-philadelphia-sodatax-idUSKCN0Z22G3. 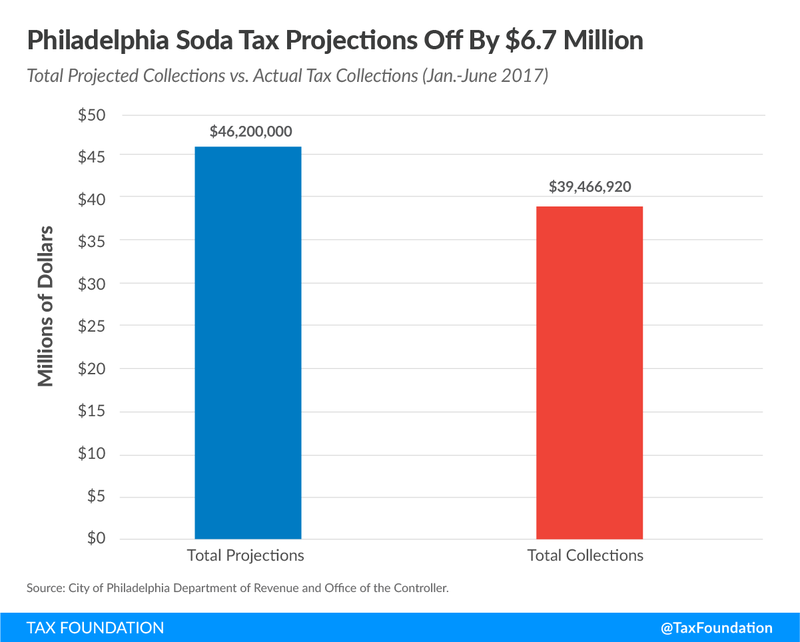 Scott Drenkard, “Philadelphia Mayor Proposes Gigantic Soda Tax,” Tax Foundation, March 2, 2016, accessed July 07, 2017, https://taxfoundation.org/philadelphia-mayor-proposes-gigantic-soda-tax. Claudia Vargas, Tricia L. Nadolny, and Julia Terruso, “Big chunk of soda tax money not going to pre-K,” The Philadelphia Inquirer, June 16, 2016, accessed July 10, 2017, http://www.philly.com/philly/news/20160614_Drink_tax_proposal_had_some_sweetners.html. “City Announces Preliminary Collections of $6.4 Million for PBT in March | Office of the Mayor | Press Release,” City of Philadelphia: Office of the Mayor, March 23, 2017, accessed July 10, 2017, https://beta.phila.gov/press-releases/mayor/city-announces-preliminary-collections-of-6-4-million-for-pbt-in-march/. Thomas A. Farley, “Philly beverage tax is working,” The Philadelphia Inquirer, March 10, 2017, accessed July 10, 2017, http://www.philly.com/philly/opinion/20170310_Philly_beverage_tax_is_working.html. 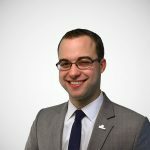 “Controller Butkovitz Raises Concerns Over Beverage Tax Shortfalls,” City of Philadelphia: Office of the Controller, June 13, 2017, accessed July 10, 2017, http://www.philadelphiacontroller.org/media/press-releases/controller-butkovitz-raises-concerns-over-beverage-tax-shortfalls. Alison Burdo, “May soda tax revenue announced as protesters force Pa. Senate committee to cancel hearing,” Philadelphia Business Journal, June 23, 2017, accessed July 10, 2017, https://www.bizjournals.com/philadelphia/news/2017/06/23/philadelphia-beverage-tax-soda-tax-may-revenue.html. Jennifer Kaplan, “Philadelphia’s Soda Sellers Say Tax Has Reduced Sales by as Much as 50%,” Bloomberg, February 17, 2017, accessed July 10, 2017, https://www.bloomberg.com/news/articles/2017-02-17/philly-soda-sellers-say-tax-has-reduced-sales-by-as-much-as-50. Ed Zwirn, “Philly’s soda tax is crushing the city’s beverage business,” New York Post, March 05, 2017, accessed July 10, 2017, http://nypost.com/2017/03/05/phillys-soda-tax-is-crushing-the-citys-beverage-business/. Scott Drenkard, “Sports Drinks Are Now More Expensive than Beer Thanks to the Philadelphia Soda Tax,” Tax Foundation, January 4, 2017, accessed July 10, 2017, https://taxfoundation.org/sports-drinks-are-now-more-expensive-beer-thanks-philadelphia-soda-tax/; see also Julia Terruso, “Philly finds new tax not so sweet,” The Philadelphia Inquirer, January 04, 2017, accessed July 10, 2017, http://www.philly.com/philly/news/politics/20170104_Philly_finds_new_tax_not_so_sweet.html. Brian Wansink, Drew Hanks, David R. Just, John Cawley, Jeffrey Sobal, Elaine Wethington, William D. Shulze, & Harry M. Kaiser, From Coke to Coors: A Field Study of a Sugar-Sweetened Beverage Tax and its Unintended Consequences,” June 9, 2012, http://papers.ssrn.com/sol3/papers.cfm?abstract_id=2079840. Philly Bev Tax website FAQs. City of Philadelphia Department of Revenue, accessed August 1, 2017, http://www.phillybevtax.com/Consumers/Frequently-Asked-Questions. Susanna Kim, “US Soda Consumption at Its Lowest Level in 30 Years,” ABC News, March 30, 2016, accessed July 07, 2017, http://abcnews.go.com/Business/us-soda-consumption-lowest-level-30-years/story?id=38036424 . “Beverage Tax Slows Philly Coke’s Retail Sales by 32%, Leading to Workforce Reduction,” The Coca-Cola Company, April 28, 2017, accessed July 07, 2017, http://www.coca-colacompany.com/stories/business/2017/beverage-tax-slows-philly-cokes-retail-sales-by-32; Julia Terruso, “Pepsi to lay off 80 to 100, blames soda tax,” The Philadelphia Inquirer, March 01, 2017, accessed July 07, 2017, http://www.philly.com/philly/news/politics/Pepsi-announces-80-100-layoffs-blames-soda-tax.html. Mark Dent, “Philly soda tax: Pepsi tells grocery stores it won’t offer 2-liters or 12-packs,” Billy Penn, March 21, 2017, https://billypenn.com/2017/03/21/philly-soda-tax-pepsi-tells-grocery-stores-it-wont-offer-2-liters-or-12-packs/. “Plaintiffs Appeal Philadelphia Soda Tax Dispute to Pennsylvania Supreme Court,” Tax Analysts, July 13, 2017, accessed July 19, 2017, http://www.taxnotes.com/state-tax-today/local-taxation/plaintiffs-appeal-philadelphia-soda-tax-dispute-pennsylvania-supreme-court/2017/07/19/1vwry. In one such instance, supporters of the tax made news voicing support by interrupting a state senate meeting of the Local Government Committee with air horns and chanting of “this is our house” in the committee hearing room. Eventually, the hearing was canceled. See Alison Burdo, “May soda tax revenue announced as protesters force Pa. Senate committee to cancel hearing,” Philadelphia Business Journal, June 23, 2017, accessed July 07, 2017, https://www.bizjournals.com/philadelphia/news/2017/06/23/philadelphia-beverage-tax-soda-tax-may-revenue.html. Courtney Shupert, “Seattle Encourages Citizens to Kick the Can in Passing Soda Tax,” Tax Foundation, June 13, 2017, accessed July 10, 2017, https://taxfoundation.org/seattle-encourages-citizens-kick-can-passing-soda-tax/; Jared Walczak, “Evaluating Soda Tax Proposals in West Virginia,” Tax Foundation, March 25, 2017, accessed July 10, 2017, https://taxfoundation.org/soda-tax-west-virginia/. Courtney Shupert is a 2017 summer intern with the Tax Foundation Center for State Tax Policy.